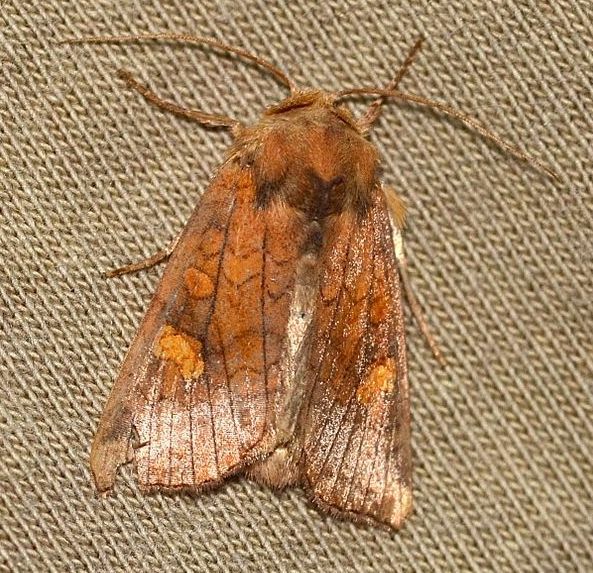 Adult Markings: Very similar in color and markings to Amphipoea interoceanica, but is larger and not as stocky (Forbes, 1954). Adult Structural Features: Males are best distinguished by the length and shape of the digitus: "long, pointed, projecting far beyond the lower edge of valve" in americana but "short, obliquely truncate, not projecting beyond edge of valve" in interoceanica (described and illustrated by Forbes, 1954). The antennae are somewhat serrate in the males, with the serrations longer in americana than in interoceanica (J.B. Sullivan, pers. obs. ).